Welcome! My name is Kelly Goodwin, and I live in the Coast Range west of Eugene. Those of us who keep bees in Lane County are fortunate enough to have access to the Lane County Beekeepers Association, an organization dedicated to outreach, education. and support. This site aspires to complement the LCBA’s efforts by encouraging the formation of an online community, a place where we can connect any time, no matter how far flung our bee yards may be. 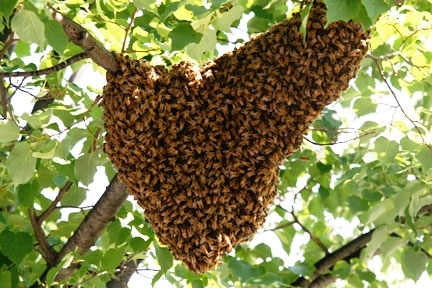 During my short time as a beekeeper, I’ve been impressed by the fact that there are “a thousand ways to do it right.” With that in mind, I chose the name HiveWays, plural, to reflect the idea that, though we may have different ways of doing things in our bee yards, they may indeed all work. So whether we use traditional methods, the latest new technology, or some mix in between, we have a voice and an ear here. Let us use both with patience and generosity! Kelly I couldn’t agree more with your “Welcome” statement. I like your blog. But will spend some time learning how to use it. Good photos. Keep up the good work. Thanks for inviting me! Hey Kelly- I love the photo of the bee swarm…I’m working with the Oregon Sustainable Beekeepers in Eugene on helping get the word out to the public and garden supply stores about not using/selling neonicitinoid pesticides…found in sprays and also plants sold in big box stores…happy beekeeping! May all bees be healthy and multiply! Thank-you, Pamela. We have certainly created a complicated environment with all our cleverness. I’m grateful for the many talented folks working towards solutions on all fronts. Happy beekeeping to you, too! Hi Kelly, I just discovered your blog thanks to the LCBA Newsletter! I, too, have a bee blog, but with a different angle (as a beginner I am in no position to provide advice to anyone)! Your posts will be a good resource for me. As it happens, the hive called “Sage” that I refer to in my blog – in the event you should check it out – came from you. Sandy helped me collect it from you at the end of March. It swarmed four (maybe five) times, but is still thriving! Healthy girls! Oh my! I guess they were really ready to branch out! Thank-you for the kind thoughts. I’ll look forward to reading about “Sage” as your blog unfolds!